An American on the Western Front tells the story of Arthur Clifford Kimber – the young student from Stanford University who carried America’s first official Government flag to France in World War I. The book combines the young serviceman’s personal story with a narrative account of the United States’ involvement in the war and is woven around a remarkable and vivid archive of his letters. They trace Kimber’s journey from springtime California in 1917 to the front in France and follow his progress over the next 18 months as he served first as an ambulance driver and then as a fighter pilot, flying with both the French and U.S. Air Services – before being killed in action weeks from its end..
An American on the Western Front allows us a fresh glimpse of the United States’ story in World War I and a young man’s experience of that conflict. Find out more about Arthur Clifford Kimber’s war story. 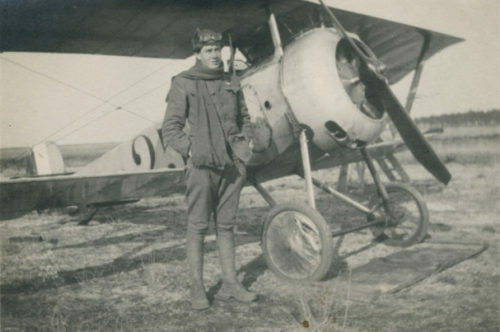 Find more information about Arthur Clifford Kimber and his work as a fighter pilot. Find out more about the First Flag and it’s journey to the western front. Find out more the authors of An American on the Western Front.